Huckleberry "Huck" Finn is the son of the town's vagrant drunkard, "Pap" Finn. Sleeping on doorsteps when the weather is fair, in empty hogsheads during storms, and living off of what he receives from others, Huck lives the life of a destitute vagabond. The author metaphorically names him "the juvenile pariah of the village" and describes Huck as "idle, and lawless, and vulgar, and bad", qualities for which he was admired by all the children in the village, although their mothers "cordially hated and dreaded" him. His appearance is described in The Adventures of Tom Sawyer. He wears the clothes of full-grown men which he probably received as charity, and as Twain describes him, "he was fluttering with rags." He has a torn broken hat and his trousers are supported with only one suspender. Even Tom Sawyer, the St. Petersburg hamlet boys' leader sees him as "the banished Romantic". Tom's Aunt Polly calls Huck a "poor motherless thing." Huck confesses to Tom in The Adventures of Tom Sawyer that he remembers his mother and his parents' relentless fighting that stopped only when she died. In Adventures of Huckleberry Finn, the sequel to The Adventures of Tom Sawyer, the Widow attempts to "sivilize" [sic] the newly wealthy Huck. Huck's father takes him from her, but Huck manages to fake his own death and escape to Jackson's Island, where he coincidentally meets up with Jim, a slave who was owned by the Widow Douglas' sister, Miss Watson. Jim is running away because he overheard Miss Watson planning to "sell him South" for eight hundred dollars. Jim wants to escape to Cairo, Illinois, where he can find work to eventually buy his family's freedom. Huck and Jim take a raft down the Mississippi River, planning to head north on the Ohio River, in hopes of finding freedom from slavery for Jim and freedom from Pap for Huck. Their adventures together, along with Huck's solo adventures, comprise the core of the book. Jim, a runaway slave whom Huck befriends, is another dominant force in Huck's life. 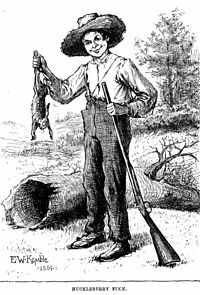 He is the symbol for the moral awakening Huck undergoes throughout Adventures of Huckleberry Finn. This is seen when Huck considers sending a letter to Ms. Watson telling her where Jim is but ultimately chooses to rip it up despite the idea in the south that one who tries helping a slave escape will be sent to eternal punishment. Pap Finn is Huck's abusive, drunken father who shows up at the beginning of Adventures of Huckleberry Finn and forcibly takes his son to live with him. Pap's only method of parenting is physical abuse. Although he seems derisive of education and civilized living, Pap seems to be jealous of Huck and is infuriated that his son would try to amount to more, and live in better conditions than he did. Despite this, early in the novel Huck uses his father's method of "borrowing" though he later feels sorry and stops. The character of Huck Finn is based on Tom Blankenship, the real-life son of a sawmill laborer and sometime drunkard named Woodson Blankenship, who lived in a "ramshackle" house near the Mississippi River behind the house where the author grew up in Hannibal, Missouri. Since Mark Twain's death, Huck Finn has also appeared in a number of novels, plays, comic strips, and stories written by various authors that purport to tell the latter adventures of Huck and his friends. ^ Huckleberry Finn by Clare Victor Dwiggins ("Dwig"), distributed by the Ledger Syndicate (1940–1942).